Ok, I'm sure I will be getting a lot of feedback from bloggers about this post, but I have to get some things off my chest when it comes to fashion bloggers. I figured the best way to do it would be in a letter to all the gorgeous ones out there. Hey! My name is Emelia. You may not know me since I've only been doing this blogging thing about a year and you may not even read lifestyle blogs. But, when I started reading blogs I began with ones that were mainly fashion based. I have always loved fashion and been intrigued with how you put together looks, and let's face it...you're all stunning. Some of the people known as lifestyle bloggers aren't particularly fans of yours. It may sound harsh, but I kind of see where they are coming from. In other ways, I totally don't get their point of not liking you. It looks like you get off easy with taking pictures of yourself, dressing up in beautiful clothes, bags and shoes and linking the things you wear to website where you can make money. It all sounds amazing, but some of these lifestyle bloggers think it's all a bit crazy. 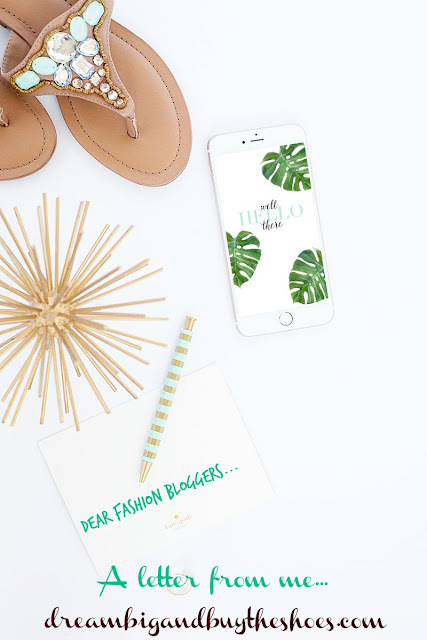 Us lifestyle bloggers have to apply to sponsored campaigns most of the time. We have to fill out forms proving ourselves to be worthy of making a post about pizza and a coupon for some frozen delicousness at your local Wal-Mart. We get paid in various forms, but they dont' seem as lucrative as yours. This causes some hostility for the rest of us bloggers. But I'm here to say that I like you, and I give you props for what you do. First of all, the amount of excercise you have to put in to take these pictures eliminates me from ever doing what you do in the first place. You probably wouldn't ever want to do a post about pizza, because then you would have to go run it off before you model that skirt tomorrow. Excercise is good and we should all do it regularly, but frankly I simply don't have all that energy on a daily basis. I've seen some snapchats and information behind the scenes that shows me that your significant others or mom's and you venture out on the weekend to shoot pictures for an entire week full of posts. The number of outfit changes in one day would make me jump ship from being a fashion blogger. I hate going to the mall and utilizing the dresssing room let alone do 5-7 outfit changes in a few hours. The editing of pictures....holy cow. I get overwhelmed just TRYING to take top notch quality pictures for 2 posts a week let alone every single one. See today, I didn't make that image above.. I was given the rights to download it and I got craz and threw some text on it. As a lifestyle blogger, I can do those things and no one minds. You can't post tomorrow without pictures, you wouldn't have a blog. If you are able to make money from promoting your links on Instagram, or your blog...good for you! I do find it a little rude that sometimes you can't just tell us where you got your shoes...you make us like your Instagram picture, then get an e-mail with the product we liked, only to find out it's not the same exact one. That's not cool...if you could work on that it would make me really happy. But overall, I really don't mind to "like to know it" ...I get it, it's a business. Aren't we all here to get something more out of life, even if it's some extra cash? You seem to go to some cooler events and conferences than I've ever seen a lifestyle blogger attend, so that's a bummer for our brand of writer but we shouldn't blame that on you. Heck, if I had the time and funds I would create and develop the most amazing blogger get together/ conference/ retreat I could dream up...but that's not happening anytime soon. Maybe we could talk to the people you work with and create some big BLOGGER get together that's not exclusively for those of you that work with Reward Style or a similar brand. Last but not least, I like you because you are still a blogger like me. Taking pictures takes time. Creating posts takes time. Your blog takes time. Responding to comments takes time. I'm sure your passion drives you to do it every day, just like the rest of us. I applaud you for all you do, and while I'm a little jealous you don't constantly have to come up with new ideas for posts...I would not want to take your job of posing 329 different ways for 5 weekly posts in 123 different outfits. Standing with my hand on my hip while looking in the distance at a tree does not suit me well, I'll leave that awkwardness up to you. Thanks for listening. I'm still reading...and admiring you. Labels: BLOGGING , FASHION , FASHION BLOGGERS , LIFE.